Plantar Fasciitis | Marathon Orthotics, Inc.
We have successfully helped treat Plantar Fasciitis and heel pain with accommodative orthotics for thousands of patients. Patient compliance is improved with this orthotic because it offers excellent plantar surface support with a softer feeling device. 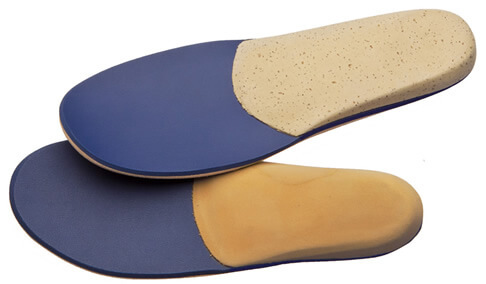 Marathon Orthotics, Inc. offers a number of shell materials of varying densities to choose from. These range from the very durable to the very soft. We can assist you in picking the appropriate shell material for your patients, corresponding to their weight, age and activity level. Typically, a very soft, shock-absorbing mid-layer is paired with a more durable, but still cushioned, top cover (FF being the most widely ordered). Note: You may add a Plantar Fascial Groove for a bow-stringing Plantar Fascial Band. This is found on the prescription order form in the Accommodations section, or simply write G in the Catalog Choice area on the prescription order form. We do not suggest that all of your patients suffering from Plantar Fasciitis and/or heel pain should be prescribed accommodative orthotics. However, in many cases they are highly effective.